Oven roasting is simple, convenient and delicious—no wonder it’s so popular! 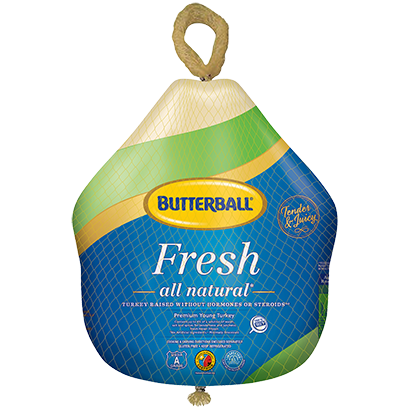 Whether you’re a first time cook or a seasoned pro, Butterball expert Janice has the answers to all your roasting questions. Since turkey cook time varies by weight, we’ve provided a handy chart below to help you. Don’t forget the foil tent when you’re 2/3 of the way through cooking to prevent dryness! Preheat oven to 325° F. Drain juices and pat dry with clean paper towels. Place turkey breast side up on a flat rack in a shallow roasting pan 2 to 2½ inches deep. If you don’t have a rack, crunch aluminum foil into a coil or use vegetables like carrots to keep your turkey off the bottom of the pan. Turn the wings back to hold the neck skin in place. (Tucking the wings will help stabilize the turkey in the pan and when carving) Brush or spray skin lightly with vegetable or cooking oil for best appearance. Insert an oven-safe meat thermometer deep into the lower part of the thigh without touching the bone. When the thigh is up to temperature, and if the turkey is stuffed, move the thermometer to the center of the stuffing. Place your turkey in the oven. When the turkey is about ⅔ done, loosely cover the breast with a piece of foil to prevent overcooking. 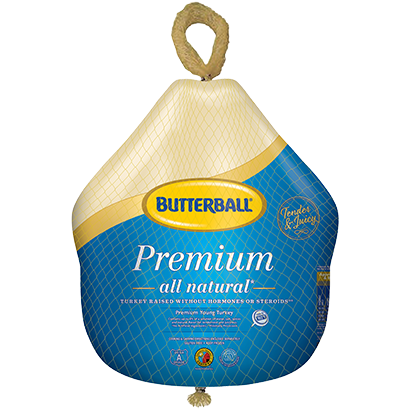 Your turkey is done when the temperature with a meat thermometer is 180° F in thigh and 170° F in breast or stuffing. Lift turkey onto platter, and let stand for 15 minutes before carving. Preheat oven to 325° F. Hold under running water and remove giblets, neck, and gravy packets. Place turkey on flat rack in a shallow roasting pan, 2 to 2½ inches deep. Brush or spray skin lightly with vegetable or cooking oil for best appearance. Cover neck and exposed stuffing with foil to prevent over-browning. Place turkey in pre-heated oven. When turkey is about ¾ done, loosely cover breast and top of drumsticks with a piece of foil to prevent overcooking. After about 3 hours, insert an oven-safe thermometer deep into the thigh without touching the bone. Begin checking the turkey for doneness about 30 minutes before the recommended cook time. 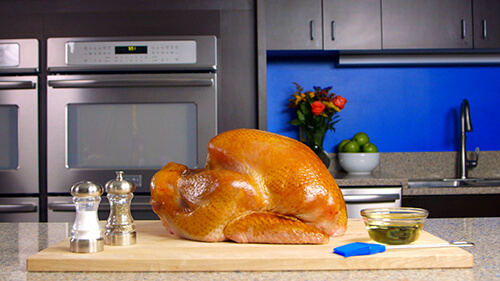 Lift turkey onto platter and let stand for 15 minutes before carving. Preheat oven to 325° F. Remove wrapper. Do not stuff. Place thawed turkey, breast side up, on flat rack in shallow roasting pan 2 to 2½ inches deep. Insert oven-safe meat thermometer deep into the thigh without touching the bone. Place turkey in pre-heated oven and heat until hot (140° F). Cover pan completely with foil for the entire cooking time. Cover breast loosely with foil after 1 to 1¼ hours to prevent over-browning and drying. Your turkey is done when the meat thermometer reaches 140° F in thigh. Remove whole breast from bag. Drain juices and pat dry with clean paper towels. Place breast, skin side up, on a flat roasting rack in a 2-inch deep roasting pan. Do not add water to pan. Roast uncovered according to Cooking Schedule or until meat thermometer in thickest part of breast reaches 170° F. If breast is stuffed, center of stuffing should be 165° F.
Roasting time will vary if turkey is covered or placed in an oven-cooking bag. Before you remove the stuffing and carve, let your turkey breast stand for 15 minutes to allow the juices to set. Roast skin side down, uncovered, on a flat rack in a 2-inch deep open roasting pan at 325° F for the first hour. Remove from oven and carefully remove gravy packet and refrigerate packet for future use. Turn breast skin side up, and brush or spray skin lightly with vegetable or cooking oil for best appearance. Return to oven. Let breast stand for 10 minutes before carving. Remove outer plastic netting and packaging. Leave inner string netting on the roast. Drain juices and pat dry with clean paper towels. Refrigerate gravy packet. For easier net removal before serving, lift string netting and shift position on roast. Place roast, skin side up, on a flat roasting rack in 2-inch deep roasting pan. Do not add water to pan. Roast uncovered according to Cooking Schedule or until meat thermometer in center of breast roast reaches 170° F and in center of turkey roast reaches 175° F.
For easier net removal after roasting, wrap roast in foil and let stand 10 minutes. Remove netting and slice roast. Since you can’t adjust the string netting when roasting from frozen, be sure to wrap the roast in foil after it comes out of the oven. Remove gravy packet with spatula and refrigerate. Place roast, skin side up, on a flat roasting rack in a 2-inch deep roasting pan. Do not add water to pan.